Janet Morrison has a thing for plants. There are several in her office, she spends most of her day talking about them, and when she is not in the classroom, she is outdoors working with them. As the resident plant ecologist here at The College of New Jersey, Morrison has even devoted her career to them. Morrison pursued a liberal arts degree in Biology at Oberlin College and in particular sought anything and everything with a field component. “The part of biology that appealed to me was always the part to do with the environment and ecology, the woods, fields, and nature,” she said. Upon graduation, Morrison tried her hand at a number of different teaching positions in math, science, and environmental education, ranging from private schools to being the “nature person” at summer camps. In time, she realized her calling was at a higher level and decided to attend graduate school. There lay a dilemma: she had too many interests, fueled in a large part from her liberal arts education. Although Women’s Studies and Ethnomusicology were thrown on the table, she based her final decision on what she loved most. From that point forward, Morrison dedicated her life to becoming a professional scientist. She obtained her PhD in Ecology and Evolution from State University of New York, Stony Brook, worked as a researcher at The New York Botanical Garden, and then, in 1997, joined the faculty here at TCNJ. In addition to her courses, which include Ecology and Field Biology, Field Botany and Plant Systematics, Plants and People, and Biological Seminar on the Ecology and Evolution of Disease, Morrison is TCNJ’s Director of Faculty-Student Scholarly and Creative Collaborative Activity. Simply put, she oversees undergraduate research opportunities across campus. The biggest part of the job is running and directing the Mentored Undergraduate Summer Experience (MUSE), but Morrison says it is also one of the most rewarding. The residential MUSE program is an 8-week, full-immersion experience, with students working full-time on research questions and also participating in a variety of scholarly and community-building activities. The program commences with an orientation, where the scope of the program is introduced, mentors discuss their research interests and projects, and focused discussions within each mentor-student team occur. 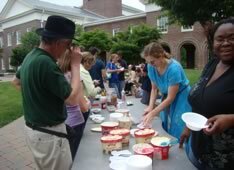 The orientation also includes an outdoor social event. This approach develops an early sense of community. Morrison says the experience is also invaluable for the faculty mentor. 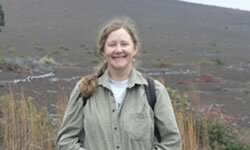 In terms of her own research, Morrison focuses on two areas: the ecology of interactions between plants and diseases in natural populations; and the ecology of non-native invasive plant species. She finds the landscape here at TCNJ to be particularly intriguing given its suburban and exurban nature and the fact it is heavily influenced by human activity. In terms of her most current research, Morrison says she is poised to begin a six forest-wide manipulative experiment investigating the interaction between the abundance of deer and invasion of non-native species. “But it’s not,” she adds. According to Morrison, what is ‘not nice’ about the forest is the abundance of non-native invasive species which drives a lack of biodiversity. For the past two years, Morrison and her team of undergraduate collaborators have conducted background research, obtained research permits, laid out research plots, and submitted a National Science Foundation grant proposal, which is still pending. The planned experiment will involve six forests in which deer enclosures are built and seeds of invasive species are introduced. Over the course of some years, the investigators will follow what happens to the vegetation with those factors interacting. Preliminary data on deer impacts in these forests has been particularly interesting in terms of examining the amount of cover in the shrub layer, quantifying browsing by deer on woody plants, and counting the number of pellet groups. When she is not in the classroom or out in the field, Morrison says she spends most of her time enjoying nature, whether it is cross-country skiing in the winter and hiking or biking in the summer. Beyond that, she has two kids, a husband, a house, her flower garden and a dog to keep her busy.